Nexiilicious | Hey, I just met you and this is crazy, but here's my MAC address, so switch my packets maybe? Hey, I just met you and this is crazy, but here's my MAC address, so switch my packets maybe? Regular Expressions are something that I still struggle to wrap my head around. However, they make things much easier and faster with parsing BGP tables, and they are of course unavoidable if you have to write an AS Path access-list. WIth practice, they do of course get better. This will get you an output of just routes that originated from AS 100. Thus, this will match anything AS Path of 100 X, where X is any other single AS. This one looks long and confusing, but when you imagine that it is simple a path of AS 100 200 300 with the option of any AS of any character between 100 and 200 and 200 and 300, it’s not so bat. Remember to use a * for zero or more instances when you want to leave the option open for NO other AS in the path – it’s the best choice to also leave the option open for just 100 200 300. Regular expressions really just require practice. Two websites that I use for practice quizzes (and find that I do not memorize the answers – too many characters) are linked below. Keep Calm and Get Your CCIE! If I had to pick a favorite protocol, it would have to be OSPF. OSPF is badass. It does a million cool things, and because I am pretty Type-A OCD, I love how organized it is. How can the hierarchy and structure of OSPF not scratch the worst OCD itch? It’s also kinda cranky and complicated sometimes, with some quirks that can cause some real hangups. One such quirk, which I have recently come across in my CCIE studies, is the Loopback network type. Loopback interfaces are not only functional to OSPF (and other protocols and network management systems) for a variety of reasons, they’re also useful to have in a lab environment. You can inject routes that wouldn’t otherwise be there by having a bunch of loopbacks. But this can introduce other problems into the environment without careful consideration. OSPF has several different network types…Broadcast, Non-Broadcast, Point-to-Point, etc. Loopback is another network type, and just like the rest, certain kinds of interfaces will default to certain types. It is also a configurable value, just like the rest. An Ethernet interface, for example, may default to Broadcast, but it can be changed to Non-broadcast, or Point-to-Multipoint, or whatever fits your given scenario. It is no different with the loopback type, and in a few cases it is advisable. One such case may be the advertisement of masks. Regardless of the mask length configured on a loopback interface, if the interface is left with the default network type of Loopback, the mask will be advertised as a /32 host route. So if the address of the loopback has a native mask of /24, it will appear in the routing table as a /32. But there’s one other reason it was poor timing – Frame Relay. My guess is if I had waited another couple of years it would have been dropped from the exam entirely. But I’m not a patient person, I want my CCIE, and I want it now. So Frame Relay it is. I uhm…don’t like Frame Relay too much. At all. But what doesn’t kill you makes you stronger, right? So a topic that I stumbled with at first, since I have always done Frame from the CE point of view – Frame Relay Switching, a newer CCIE R&S topic in the last couple of years. It is an easy one to lab up and test in a three router topology using back-to-back Frame Relay – no need to build out a Frame Cloud. 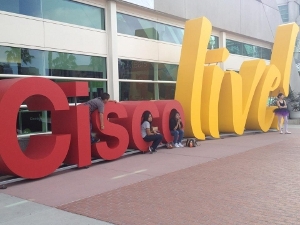 Cisco Live…where do I start? This was my first year attending Networkers, though I have wanted to go since I knew what it was. It far exceeded my expectations, and they were pretty high. San Diego couldn’t have been a better venue for my first forray. It’s an easy city to navigate, not to mention it’s beautiful (understatement). The Convention Center was directly across from my hotel, can’t beat a quick walk…especially when you’ve already overslept for the 8am class…again! I felt like the whole city was decked out in Cisco Live gear! I may have also decked myself out at the store. ;) I came in early on Saturday so I could register and find my way around, since I was scheduled to take the CCIE R&S Written on Sunday afternoon. Registration and material pickup were a breeze. The sessions – out of this world. It would take me hours to go into each one of them, but the standouts for me were as follows. If you went to San Diego or have access to the PDFs, I highly recommend downloading the class material. Highly Available Wide Area Network Design – David Prall – This was my first day, and it was a knockout. We are fortunate enough to work with David on occasion since he’s here in DC as well. He’s truly one of the best, and also one of the coolest guys ever. His class focused on optimization of WAN environments, and though ours is small, I picked up a lot of excellent information here that applies to any network. A lot of the information was new to me, so this was a great start to the week. David was also a great speaker with some excellent case-study type examples. Mastering Data Center QoS – Lucien Avramov– This session focused on QoS for the Nexus family, which is of course near and dear to my heart. ;) I mean, I do love all things Nexii. My QoS skills (not fabulous to begin with) haven’t been exercised much beyond CCIE study, so this was awesome for me. Like many engineers, I usually associate QoS with VoIP and video, but Lucien really brought to my attention how beneficial QoS can be in the Data Center for other traffic (Storage in particular). As we are in the process of standing up several new deployments, I was thrilled with this perspective, and am very excited to implement some of Lucien’s ideas. He also did an excellent job of helping us understand how to offer QoS for Data Center at the same time as VoIP and Video, and make it all work together. Fun, engaging session. Routed Fast Convergence and High Availability – Denise Fishburne – Denise was awesome; this was a great session. As someone who is in the process of a core re-design effort, this one gave me a *lot* to think about, especially paired with David’s session. Her “Culture of High Availability” was a great concept, and really helps to think about what engineers want to design towards. The big picture of high availability (even outside the routed protocols) along with coverage of NSF, BFD, and timer tweaking where appropriate definitely sent me home itching to rethink a few of my plans. Troubleshooting BGP – Daniel Walton – Last session on the last day, and I’m glad this was it. Dan definitely kept my attention the whole time, despite a flight out a few hours later. As someone whose perspective of BGP has been almost entirely from the CE side of the house, this was great. I’ve had a foray into iBGP in a VRF-Lite environment, but this filled in a lot of gaps for me, especially going into the CCIE Lab study. What was great is that everything Dan covered was absolutely useful, much of it for general troubleshooting and not just BGP. I especially liked his coverage of Bestpath selection and Table Version troubleshooting; things I had not yet gotten to see. Very helpful! Great end to the week. Mobility – Cisco’s conference iPhone/iPad app was awesome. I lived by it the whole week. Being able to use my phone to see where I was going next, move classes around, and find out the schedule for the day definitely helped. Also the ability to download PDFs and follow along during the sessions. When you’re short and can’t see the screen over 100+ people, this is key. Organization – I can’t believe they managed to pack 17,000 people into one convention center, feed us, get us from session to session, and still never feel like we were a total herd of cats was unbelievable. World of Solutions – Not only did I get to meet up with some excellent vendors and shop around for some products we may need, but Cisco’s own demos were fantastic. I got to see a lot of technology with which I don’t often get to interact. Fantastic. Customer Appreciation Party – They rented out Padre Stadium. Seriously? That was pretty incredible. As a huge baseball fan, I was thrilled to be running around on MLB grass. But Weezer, food, beer fireworks. Yes please! Mythbusters Closing Keynote – I mean, you just can’t say anything more than Mythbusters. Awesome. What a week. I’m still coming down from the high of being there, and I left five days ago. Can’t wait for Cisco Live 2013 in Orlando!